We arrived here in Paris about ten days ago, happy and exhausted. An old life left behind, a new one waiting for us, and a new house to begin with. To make new walls a home, it always helps to get things started in the kitchen. To me the kitchen is the centerpiece, the heart of the house, and it has to be alive and steaming from the beginning. So while unpacking the first boxes of plates, pots, pans and kitchen gadgets, I couldn´t help but thinking about what to cook first. So many dishes came to mind, a merry-go-round of culinary classics went on in my head: confits and blanquettes, brioches, charlottes and hachis parmentier, moules and rillettes… impossible to narrow the choices down to just one recipe! And finally, I made something else anyway, a summer version of tarte Tatin. For when we strolled over the nearest market a few days ago to get familiar with our new surroundings, I was so amazed by the atmosphere, the friendly people, the produce, that, well, I bought massive amounts of fruit and vegetables, among them a whole lot of white peaches. They looked and smelled so good and the kids love them, but we ended up with far more than they were possibly able to eat. So I had some left, and since I love to make caramel and was eager to find out how it would work with a gas stove (I´m new to cooking with gas), the idea for this peach tart was born. I just hope the Desmoiselles Tatin don´t mind me for changing their wonderful recipe! In a small high-sided saucepan (or in a baking dish that can stand the heat of your stove), mix sugar with a little water. Melt over medium heat and don´t stir until the sugar is bubbling and gets amber coloured. Remove from the heat and stir in the butter in small cubes. Add rosemary. Toss quartered peaches so they are covered with caramel. Arrange peaches tightly in the baking dish (20 cm diameter), peel side down, avoiding gaps. Bake in the oven for 15-20 minutes. Meanwhile, cut out a circle of approx. 23 cm in diameter from your puff pastry sheet. Prick with a fork several times. After 15-20 minutes, take baking dish out of the oven and cover with puff pastry. Create a rim with the overlapping puff pastry by inserting it into the baking tin. Bake for another 25 minutes or until golden brown. Unmould while warm, turning the tart upside down. Serve with crème fraîche or a dollop of greek yoghurt. Schon lange bevor wir vor etwa 10 Tagen in Paris angekommen sind, habe ich mich gefragt, mit welchem französischen Klassiker ich wohl die neue Küche gebührend einweihen könne. Auf alles mögliche bin ich gekommen, von Confit de canard über Blanquette de veau, Charlotte und Hachis parmentier, Moules und Rillettes – nur nicht auf das, was ich letzten Endes dann gebacken habe: eine Tarte Tatin mit Pfirsischen, denn die sahen auf dem Markt so viel besser aus als die üblichen Äpfel und sind das momentane Lieblingsobst meiner Kinder. Ich habe ein paar zu viele gekauft und mußte sie “verbacken”, und außerdem wollte ich unbedingt das Karamellrühren auf dem neuen Gasherd üben. Ich hoffe, die Desmoiselles Tatin werden mir verzeihen, daß ich ihre geniale Erfindung ein bißchen abgewandelt habe! In einer mittelgroßen, hochwandigen Pfanne (oder in einer geeigneten Backform) Zucker mit etwas Wasser vermischen. Bei mittlerer Hitze zum Kochen bringen und goldbraun/bernsteinfarben karamellisieren lassen, ohne umzurühren. Vom Herd nehmen, klein geschnittene Butter einrühren. Rosmarin zugeben, Pfirsischviertel in dem Karamell wenden. Pfirsischviertel dicht an dicht möglichst lückenlos in der Backform (20 cm Durchmesser) anordnen, Hautseite nach unten, und 15-20 Minuten backen. Inzwischen aus dem Blätterteig einen Kreis von 23 cm Durchmesser ausschneiden und mit einer Gabel mehrfach einstechen. Backform aus dem Ofen nehmen, mit dem Blätterteigkreis abdecken und den Rand nach innen einschlagen. Weitere etwa 25-30 Minuten backen. Warm aus der Form auf ein Kuchengitter stürzen und abkühlen lassen. Congratulations on your move, it takes a while to feel at home. I adore your little Hildesheimer Rose spoon. I love caramel and I love peaches. I pinned the recipe for later use. I guess your´re so right, Gerlinde – I´m beginning to realize I´m not on vacation here. Amazing and a bit intimidating at the same time. But as we´re here together as a family, feeling at home as also to do with being close to one another. Thanks for the good wishes, Gerlinde! I really appreciate that ! I’d never thought of using rosemary with peaches; thanks for that idea. I’m sure the aromatic would add a complexity to the tart and temper the sweetness. I wish you every joy in your new home. Thank you, Mary, I hope you´ll find the moment to try the recipe – the peaches are wonderful, juicy, sweet and fresh, especially with a dollop of crème fraîche, or greek yoghurt, that´s a must! Sadly I’m in Istanbul without an oven! But I’ll definitely try it when I’m back in Sydney and peach season comes around again. Bonjour Sabine, how nice to hear from you having arrived and settling in – I always love the moment when the stressy part of moving is over and you can start to explore the surroundings & make the new house a home, discover the quirks and creaks and begin to breathe again! 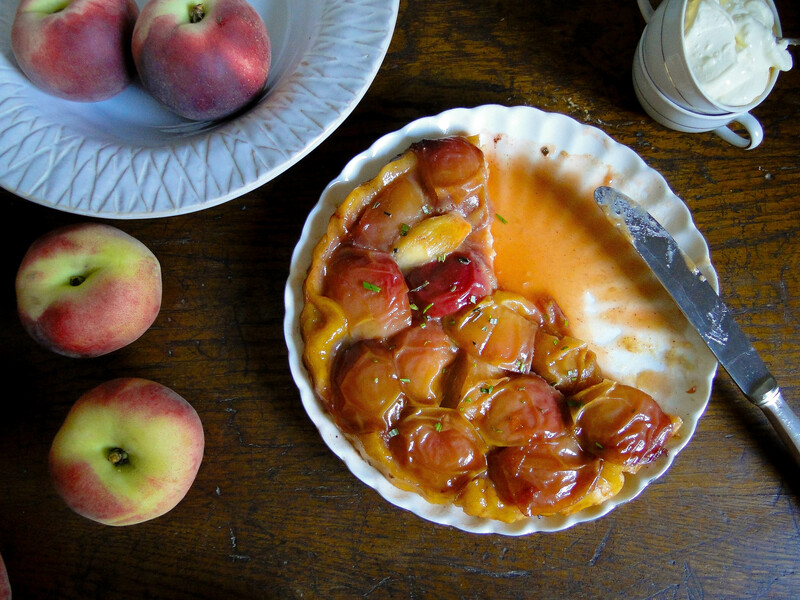 My mum makes a peach & rosemary cake, haven”t thought about that in a while but what an inspired twist to turn the apple Tatin into a peach, j’adore ca. Have a wonderful weekend! A très bientôt, Sabine. Congrats on the move! And what a beautiful way to celebrate! The tarte tatin looks delicious!! Merci, Serena! Have a wonderful weekend! This looks marvelous! I’ve never made tarte Tatin, but from your instructions, it really doesn’t look too complicated – I’ll have to try it one of these days. Good luck with unpacking! I too always start with the kitchen. It´s easy, please try! And so rewarding to end up with that classic tart filled with wonderful caramelized fruit! It’s so wonderful that you moved to Paris! I hope it is as romantic to live there as it is to vacation there! Your tarte Tatin is gorgeous and so perfect to make in a kitchen- it must have given everything such a wonderful aroma! Can’t wait to try this. I´m truly glad you like to try the recipe, I´d be happy to hear how it worked out! Have a lovely remaining weekend, Sabine. How exciting to have a new city (not to mention that it’s Paris!) to explore. And what a beautiful tart. How right you are about Paris. It´s quite unbelievable I´m really here! Ohhh this tarte tatin – I couldn’t have thought of anything more comforting to make yourself feel at home. Flaky crust, sweet caramel and juicy fruit – congratulations to your move and this tarte…. Nothing can go wrong when caramel is involved! 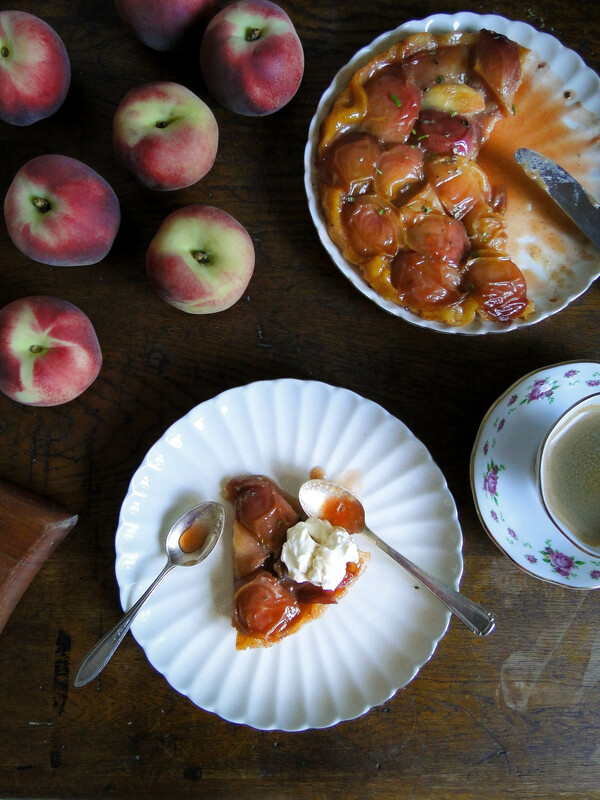 Apples, peaches, apricots, pears – this kind of tarte is just a genius invention by the Tatin sisters! Thank you – tarte Tatin is just such a genius invention and works with so many fruit… have a nice weekend, Sabine! sabine, have a ☀ weekend, too. So nice to meet you. I’m Gail. This looks fabulous. I love tarte tatin and will try this version . Thanks for liking talesandtravel. Thank you! You have a beautiful site! Thank you so very much! I´m so glad you like it, Cindy! Danke fürs Reinblicken und den lieben Kommentar, Wolfgang! Hab ein schönes Wochenende! Having been in Paris a week ago, I wish you well in that amazing city with great open-air markets. I will use your recipe sans rosemary. Maybe ginger instead. Thank you! Glad you stopped by, and happy baking! Please let me know how it worked out for you!